I thought I would share one of my family’s favorite recipes. The key to this recipe besides goat milk 🙂 is real butter. I have made it with margarine but the taste is no comparison. Mix together your dry ingredients. I like to mix mine in a pourable pitcher. In a measuring cup pour your milk and add eggs. Mix together. Pour wet ingredients with the dry ingredients. Do not over mix. Add any extras, my boys love mini chocolate chips but Handy Man and I do not. I will usually make a few pancakes then add my chocolate chips so everyone is happy. At this point, I like to let my pancakes rest while I heat up my griddle. You can use a frying pan as well. Make sure to use non-stick spray or a little vegetable oil. Cook pancakes until you see a nice supply of bubbles, I will also peak under to make sure they are nice and brown. This should take just a minute or so. 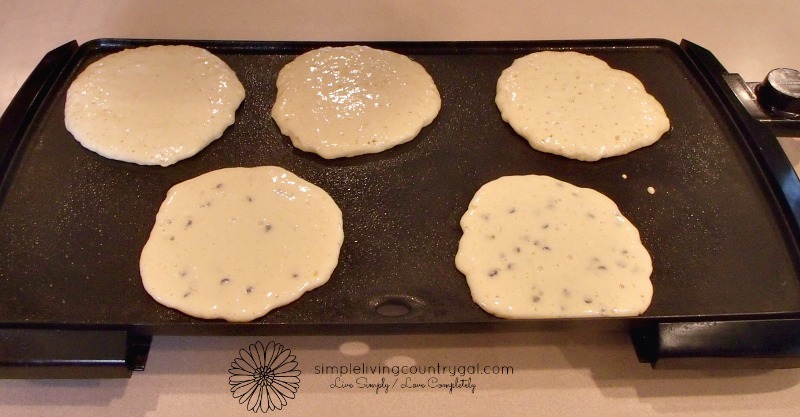 Flip pancakes over and cook an additional minute. These pancakes are best buttered and drizzled with homemade warm maple syrup. 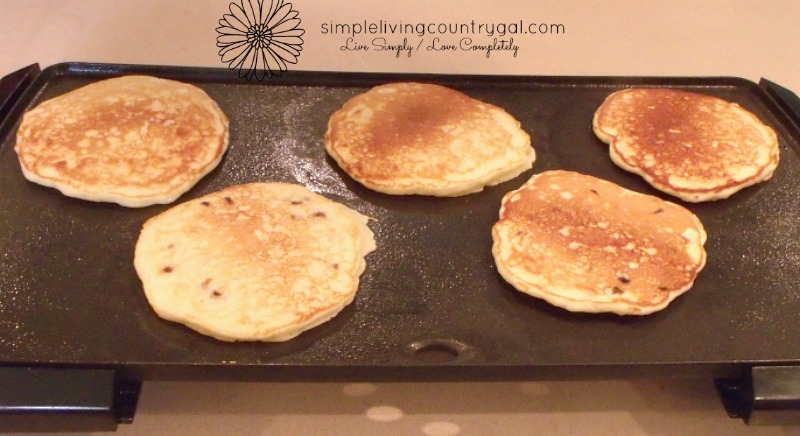 Nothing says Saturday morning than a plate of warm pancakes, enjoy! 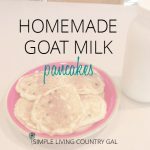 These pancakes are light and fluffy and so easy to make! In a pitcher bowl lightly mix all dry ingredients together and set aside. 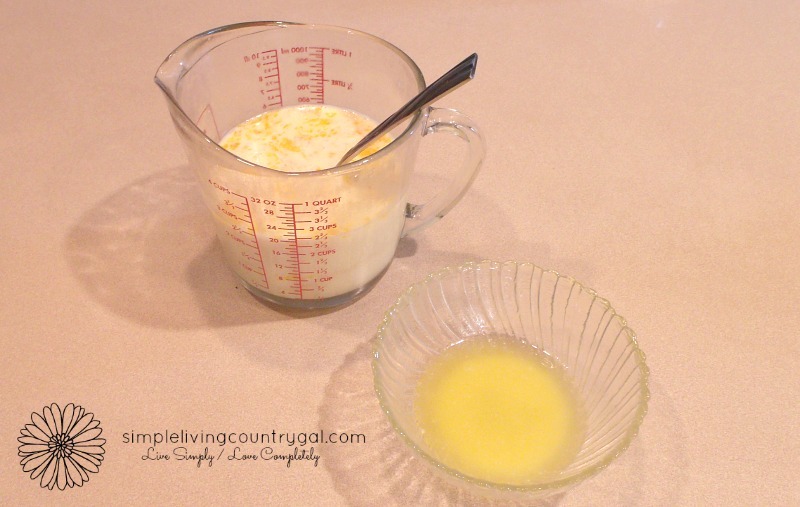 In a separate bowl combine milk and eggs, add melted butter. 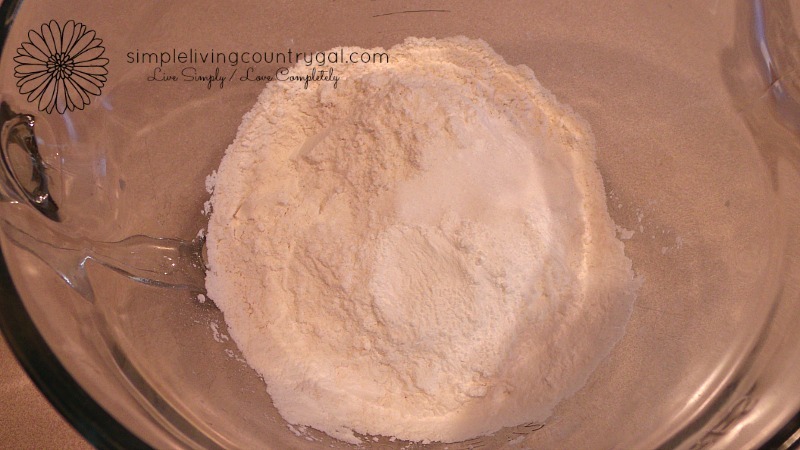 Add wet ingredients to dry ingredients and mix until incorporated. Do not over mix, a few lumps are just fine. 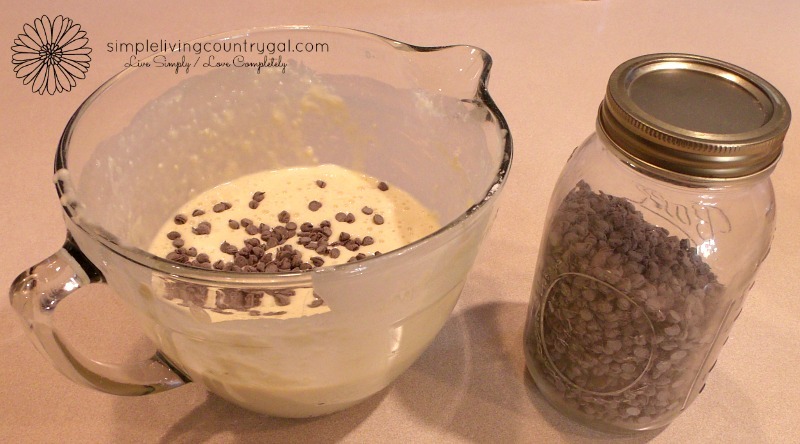 Add chocolate chips if desired. Let batter sit for a few minutes. Preheat griddle or non-stick pan. Coat with non-stick spray or vegetable oil. Pour batter or ladle onto griddle. Cook 1-2 minutes until bubbles form and pancakes are nice and brown. Flip carefully with a spatula and cook an additional minute. Pancakes taste best warm, buttered and drizzled with maple syrup. Enjoy!